Ann and I sat around our breakfast table this morning talking about a conversation that she recently had with a friend about Medicare. Of course Ann is a bit of an quazi-expert on the topic since our health insurance company dumped her when she became disabled - that is what insurance companies do when a person goes on a procedure like hemodialysis or is disabled by illness or accident. Their lobbyists made it happen years ago. 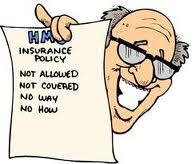 Insurance companies have the same business model as our local casinos. Rarely does anyone ever beat the house because the proverbial deck is stacked against clients of these companies. I do not know why so many Americans advocate for companies that do not have products or services and act so badly when someone makes a claim. The insurance industry has a very strong lobby in Washington, DC. They have been lobbying for the government to relieve them of the difficult cases for many years. They have already gotten legislation passed to exempt them from covering senior citizens, the disabled and many costly procedures (like hemodialysis ) and they do not want to cover people with preexisting conditions. They are a bit like the people who run the casinos in Vegas.. So when I read about lawmakers wanting to privatize Medicare I wonder what the insurance lobby thinks about that since seniors are not really a demographic that these companies are aggressively pursuing. Will lawmakers also opt to dump the disabled from Medicare roles? I am wondering what insurance companies will even insure such people. Color me confused. I find if I'm uncomfortable at one temperature, switching the thermostat at the other extreme makes me just as uncomfortable. I am not in favor of socialized medicine, but even that seems preferable to putting things totally in charge of the insurance companies. Their main goal seems to be figuring out how not to pay out to the people who really need it. I think that you echo the sentiments of many of us Mike.